You have to start your vacation right. 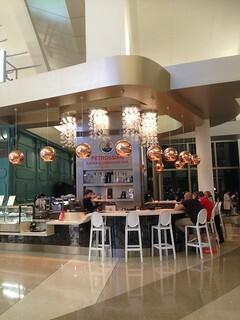 We did just that before jetting off to Fiji thanks to Petrossian at the LAX Tom Bradley International terminal. If you haven't been yet, the newly renovated terminal is gorgeous with many shops and restaurants that you'd actually want to go to. You don't have to fly out of TBI, you can still get into the terminal with any valid boarding pass from the same day. 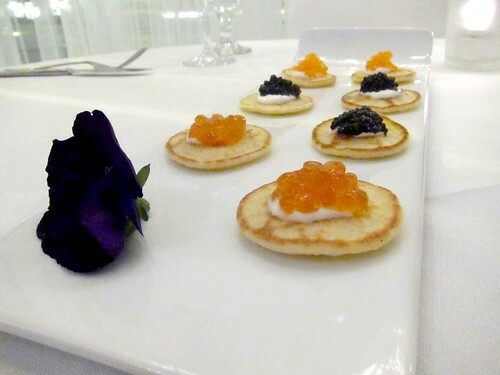 The full lineup of Petrossian's caviar is available here for 30g servings with blinis. Of course, champagne to pair ... what better way to start your vacation? 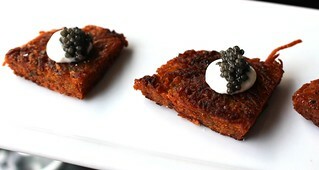 I had the Transmontanus caviar with some Moet. 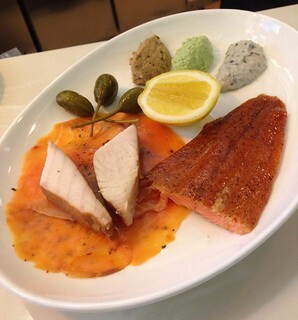 Even though the kitchen space is limited, you can still get a full meal at Petrossian, with salads and flatbreads, or a plate of cured fish. On the day I left for London, the new Petrossian at LAX Tom Bradley International Terminal was having a media tasting, so of course I had to go! Talk about perfect timing. 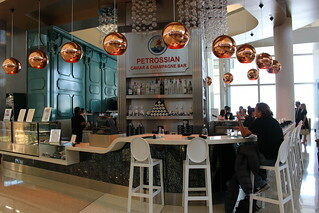 It was my first time at the new terminal, and the classy Petrossian decor matched the sleek terminal. 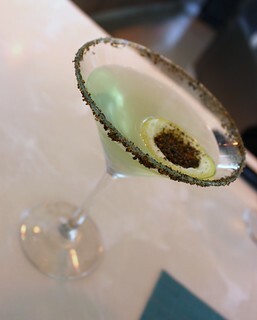 Now, jetsetters can wait for their flights while drinking cocktails garnished with caviar powder. The High Society cocktail is made with Tanqueray gin, St. Germaine, and green chartreuse. 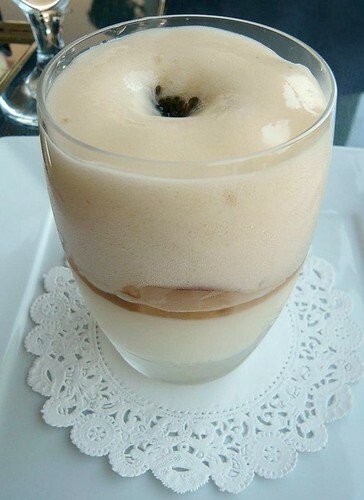 The glass is rimmed with caviar powder, which is also in the lemon "boat"
As July 1 is looming ahead, what better way to say farewell to foie than with ... desserts? OK, so you can partake in a couple hundred dollar five-six course foie gras menu, but if that's too much for you, here are some places in LA who had been serving up foie gras desserts. 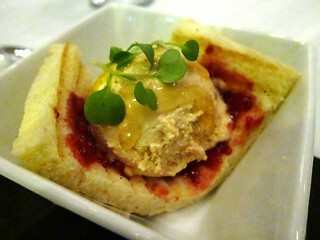 Imagine eating a cold, sweet foie gras terrine with brioche and jelly. That's almost what this super-decadent was like. 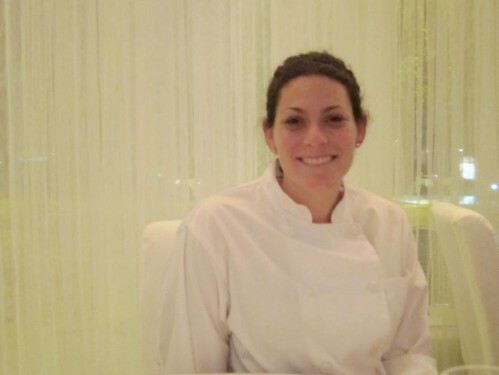 This was originally a special for DineLA week, but it was popular enough that Chef Giselle Wellman wanted to make it regularly available. At Father's Office, Sang Yoon combines the hazelnut foie ice cream with oatmeal cookies. The taste of foie gras is not as strong here as with the foie gras ice cream at Petrossian, but it's a wonderfully smooth cheesecake and the light foie flavor does come out at the end. Foie gras mousse elevates this jelly doughnut at Umamicatessen, and the combination with the peanut dust made J Gold call this "the most luxurious peanut butter and jelly sandwich in the world." It occasionally happens that even a foodie can't figure out where to go for a nice Sunday brunch. The old places seem boring, but can't think of a new place to try. So when Petrossian came up as a suggestion, I suddenly remembered a recent article about its renovation in one of those daily newsletters like Daily Candy or Tasting Table. Perfect idea! Petrossian is famous for its caviar, but its West Hollywood outpost has had a cafe attached to it for many years. This has recently been renovated to a spacious modern space. The menu selection was surprisingly varied (including a foie gras salad! Hey, salad is healthy, right? ), although I wasn't sure what to expect before coming there. 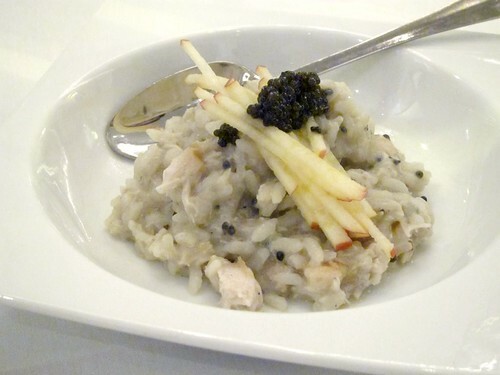 Besides the a la carte menu, they also offer a 3-course champagne brunch for $35. I opted for this and got a glass of Louis Roederer Brut Rose. The first course was a choice of soup selection and I opted for the White Asparagus Veloute. 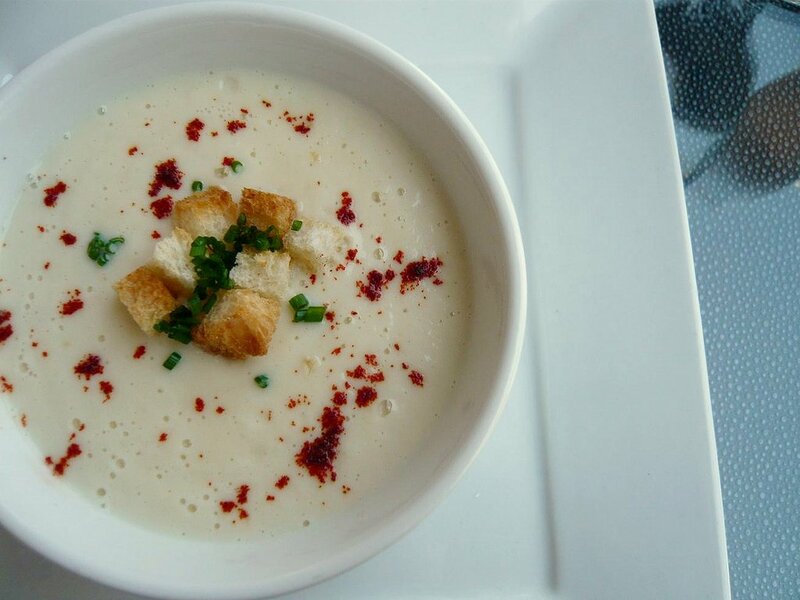 The veloute was smooth and creamy while maintaining the foaminess of veloute. It was outstanding, with a nice little onion kick. Highly recommended. 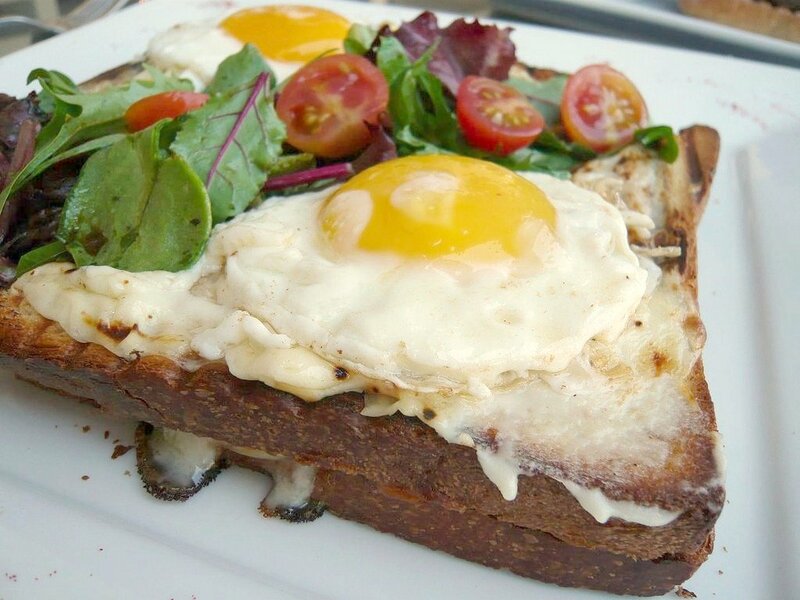 Croque madame is the perfect breakfast for me. Eggs, cheese, ham, toast ... Not to mention Brioche toast here. Perfect. Runny sunny side up, nicely toasted brioche, lots of gruyere. Even a bit of salad to cut all that richness so you can go for another bite, since the first bite was immensely satisfying. Beautiful layering here: panna cotta, white peaches, topped with the espuma. 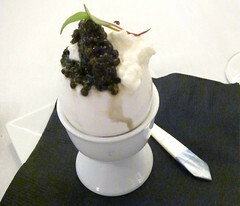 The second time I had panna cotta with caviar in a week. 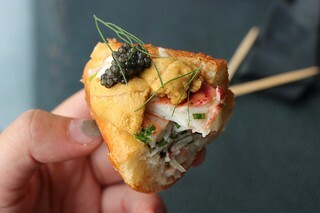 The one at Ludobites, though, had caviar as the main focus while here the caviar is just an extra. That bit of saltiness does give it a nice touch, but it isn't the point here. The panna cotta was very dense and rich, more so than the usual. The white peaches were sweet and crisp, and everything was complimented by the light peach foam on top. 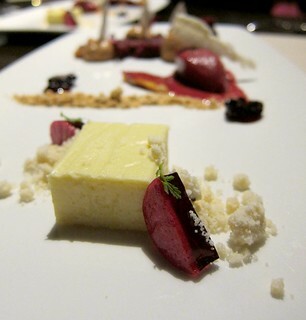 An excellent and very memorable dessert, I would recommend this to anyone and would definitely get it on future visits. 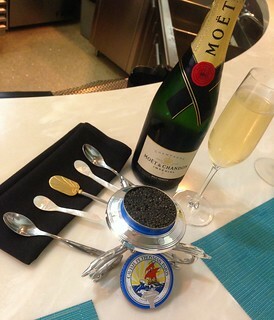 My first visit to Petrossian was such a pleasant surprise. 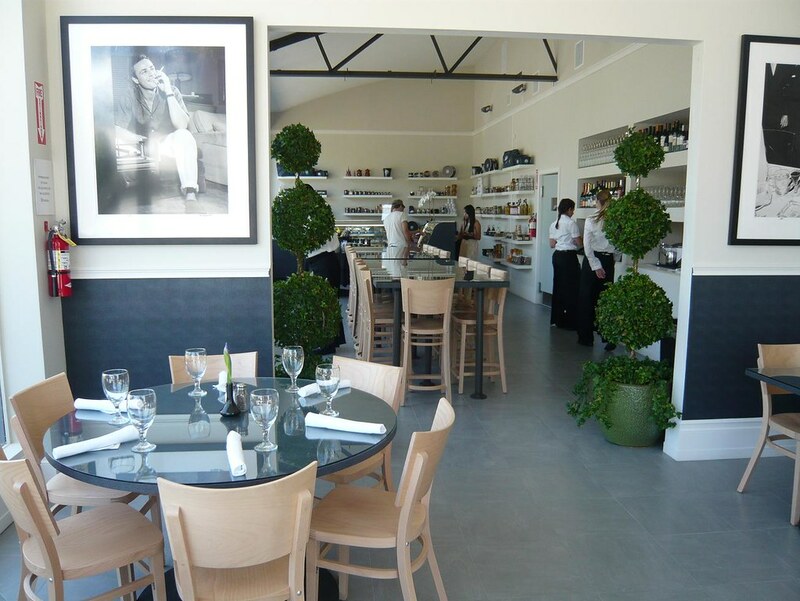 The newly renovated space had a clean and spacious look, and the food was excellent. I hope they'll keep up the performance.